In Town Luxury Home on Elk Avenue. 4 bedrooms, 3.5 bathrooms, sleeps 10. Walk to Everything! Stop your search for the perfect vacation rental. You've found it with Elk Ridge! This fabulous 3,000 square foot, 4 bedroom, 3.5 bath home in the town of Crested Butte is nothing short of stunning. Located right across the street from Rainbow Park and on the quiet end of Elk Avenue, this home couldn't be more perfect for your next vacation. Add fabulous landscaping, a great back yard and deck area, off street parking, and a gourmet kitchen with marble counter tops and you can't go wrong. The mix of reclaimed log siding, distressed wood and tin accents give this home a distinct mountain feel with the benefits of being located in town across from one of the best parks. Let the kids play in the back yard while grilling out or relax in the park across the street which includes a soccer field, a climbing boulder, playground area, and covered pavilion. Entering this home begins in the custom mud room with cubbies and hooks for all your gear. This beautifully designed area of reclaimed antique lumber sets the tone for the rest of the house. Step into the main living area with warm hardwood floors and a double sided rock fireplace that is the focal point and heart of the home. The kitchen is a chef's dream with stainless appliances, built in Boo's butcher block, massive farm sink, and a 6 burner wolf range with a griddle for morning pancakes...all set amongst beautiful carrara marble countertops. The kitchen is open to the living and dining areas, ensuring that the chef in the family doesn't miss out on any fun. In the living room, sink into the oversized couch and catch a movie or cozy up with a good book. The outdoor deck is wonderful in the summer and fall and the Weber grill is ready for even the biggest steak. Should you feel the need to work remotely while on vacation there is a beautiful office with lots of natural light and great views of Mt. Crested Butte. Downstairs, the finished basement is the kids area and what an area it is! There is a bedroom for 4 with stilted twin beds and rolling twin beds underneath. The media room features a large sectional along with a flat panel TV with surround sound and an X-Box game console. There is also a full bathroom on this level with dual vanities and an oversized shower. Throw in stained concrete floors and it might be the perfect kids space! Upstairs you will find the master bedroom with king bed, vaulted ceilings, and spectacular views of Mt. Crested Butte. The master bathroom features a massive shower and huge soaking tub for relaxing the muscles after a long day of skiing or hiking. Down the hall are two more bedrooms, one with a queen bed and the other with a twin and a double. These two bedrooms share a bright and cheery bath just outside their doors with a shower tub combo that with an oversized soaking tub. Even the window in the shower has a view of Mt. Crested Butte! Rustic wood accents,polished marble, and luxurious furnishings all add up to a spectacular home in a spectacular location!. 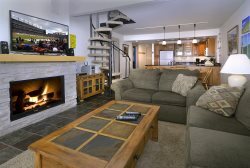 Start thinking about your vacation next year because you will want to stay in Elk Ridge time and time again! Great house. Very comfortable. Well stocked kitchen. Very pleasant stay. Very impressed with supplies that were in the unit - ie tissue, detergent, towels, etc. We had 7 people (4 adults and 3 kids ages 11, 9 and 7) for Thanksgiving week. It was perfect! The house is absolutely beautiful- my dream house, really. Very well constructed with high ceilings and gorgeous finishes. The kitchen is large and very well equipped - I made an apple pie and corn cobbler and had everything I needed (and more!). The bedrooms offer privacy- three on the top floor and one in the basement. There were TONS of games and toys, including an Xbox, and the basement was a perfect place for our kids to play. This house is walking distance to town (my in laws chose to drive but the few blocks walk was very enjoyable for the rest of us). The house also sits right next to open space trails that are beautiful. I can't recommend this house more highly-such a fun and comfortable vacation! Loved the house. Incredibly well looked after and top-notch finish on almost every aspect. Views of Mt Crested Butte are incredible. Spent 3 night during CB Bike Week,m. The house is perfect with a well equipped kitchen, so much so you'll just want to stay in and cook! Very spcacious, beautiful constructed and decorated, and the location is incrdible! We hope to be back soon! Great place to stay and we will be back. We rented this house for the Thanksgiving break. We had 9 people and we all had lots of room and were very comfortable. The house is beautiful. We had a couple light bulbs go out and the property management company responded and came over right away to fix it. Great location, great view! Hope as a family we can stay here again! Very easy check in. Clean and quiet. Would definitely stay here again. House was in great shape and everything worked great. It was perfectly stocked and the location was wonderful and quiet. So happy we stayed here. It was very enjoyable, all good for all of us. Booking with Iron Horse was extremely easy. The staff made it very clear what would be charged to my credit card and explained how the transaction would work so that it all made sense. This property is amazing! It is basically my dream home. Very well built, beautiful location next to open space trails, and walking distance to town! Everything was clean and comfortable. My kids loved all of the games that were available for us to use - tons of toys and an Xbox too. I can't compliment this property enough. If I could recreate this house in Boulder, I would! 5 stars for sure! My husband and I stayed in this house with our three kids (11, 9, 7) and my in-laws. Everyone was HAPPY! The little I communicated with staff was all stellar. Due to the ease and efficiency of booking, there was little need to communicate with staff. We loved the Elk Ridge house. It was amazing, beautiful decorated and meet all of our needs. The booking process was painless. I had a nice conversation with one of your employees who was shoveling snow at the house on Thursday of last week.